Operators: Kosicin L., Nogin P.
Panorama of the surroundings of Miass. Types of the Ural taiga, stone blocks among the trees. Engineers-builders inspect the site for the site of construction of a new automobile plant, check the area with the map. Clearing of the construction site, felling and removal of trees. Welding in one of the buildings being built. Checking the equipment of the new workshop. 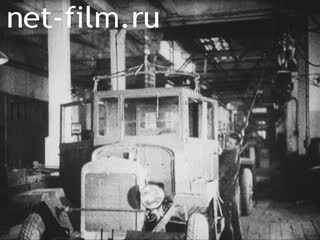 Types of new buildings of the Ural Automobile Plant named after Stalin. One of the buildings of the plant, a sign over the factory entrance. The gate of the factory opens. Internal view of one of the shops. The work of the foundry of the plant, the type of machine conveyor. The internal view of the various workshops of the plant. Assembly of engines on the conveyor. Start the assembly of the first car, install the frame on the conveyor. Engineers check the build quality. Installing the wheels, the worker tightens the nuts. General view of the conveyor for assembling cars. The first truck "Uralzis" departs from the conveyor. The driver sits in the cockpit. The director cuts the red ribbon, the car starts moving, the workers applaud. The rise of the red flag. Panorama of the rally of factory workers on the occasion of the release of the first batch of trucks. Heads of the plant on the balcony of the building of the plant management during the solemn rally. Plant Director Khlamov G.S. And the secretary of the Chelyabinsk Regional Committee of the CPSU (b) Patolichev NS speak at the rally. The folk festivities of workers after the rally, people are sitting at a common table, walking through the forest. People rest on the bank of the river, they bathe. Panorama of a part of the river at sunset. A column of new trucks passes through the plant and leaves the gate. A column of trucks on the road.